Grindstone is a stout, ruggedly constructed bull who adds a load of power into his progeny. His calves own great muscle mass and shape with extra eye appeal. 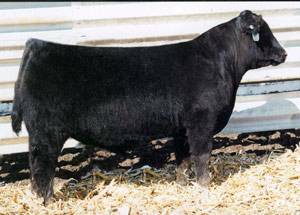 Here's a great sire for you to use to add marbling into your progeny without sacrificing any "look" or performance. Grindstone, a former sale topper at Steele's, IA, continually sires some of his best calves.